Last call for Birthday Wit! Do you need a card for someone who’s always joking around? Then this stamp set is perfect! Say happy birthday with a sense of humor!!! 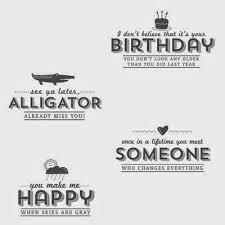 ”Birthday Wit” is a funny stamp set that you can use for anybody and will allow you to create a card in no time! But this stamp set will also retire at the end of the month, so make sure to put in your order by May 31! This card literally only took a few minutes to put together and the result is a great looking card! Do you agree? The washi tape adds a lot of colors and dimensions to this card! 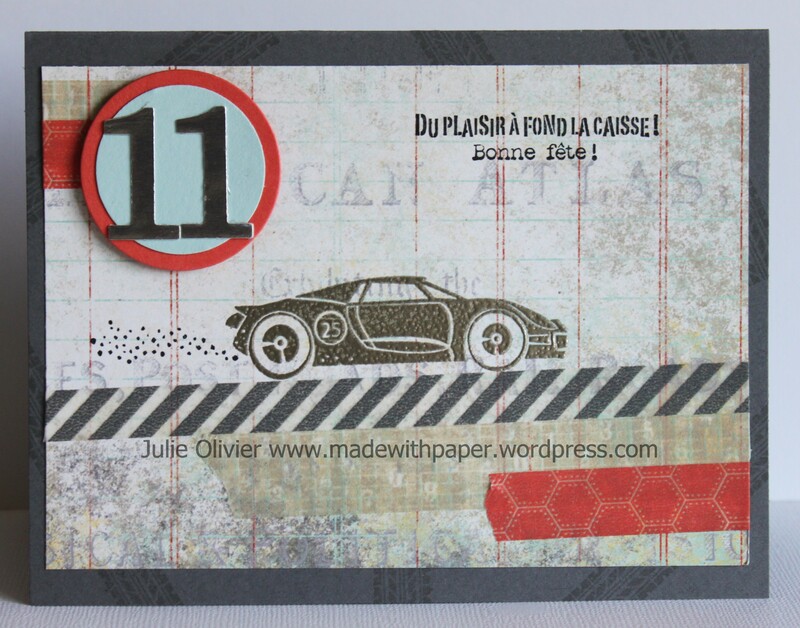 Here’s a bonus card made with the same stamp set. I used some old designer paper left over that matched well the theme of the ice cream!!! Good Morning to you! I hope you like today’s card! 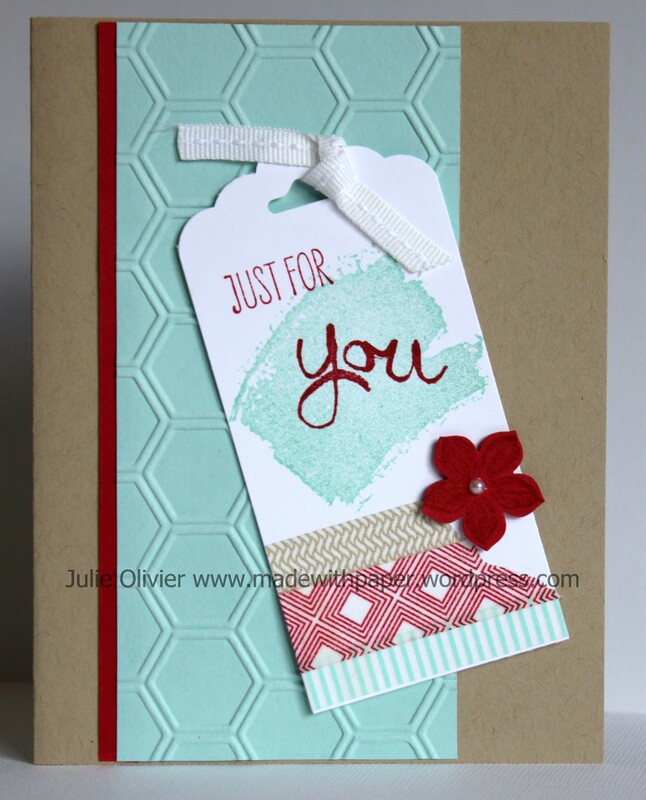 The main focus on this card is a tag that I created with the Scalloped Tag Topper punch. I used some of the Beach House Washi Tape to decorate it and I stamped the tag with the new “Work of Art” stamp set. I added a Real Red “Petite Petal” flower for a punch of color! The background is embossed with the Honeycomb embossing folder. The Scalloped Tag Topper is perfect for so many uses! It’s a great addition to your stamping supplies! Shop online here! Petite Petals, Gorgeous Grunge and Washi Tape: Fast and Easy card! Today’s card is a quick and easy card that I put together in no time at all! Don’t you like those last minute cards that you can finish in less time than you would take going to the store? I used the Gorgeous Grunge set (my favorite background set, that I use ALL the time!) and the Petite Petals stamp set with the coordinated punch. These two sets are awesome for beginners (and for long-time stamper too!) as they are so versatile! I also used a strip of Washi Tape from the Project Life Everyday Adventure Accessory pack. The greeting is from “Four You”, a very good greeting set for new stampers too! 1- Cut half a sheet of Bermuda Bay card stock (5-1/2″ x 8-1/2″). Fold in half to form the card base. 2- Cut a 4″ x 5-1/8″ Whisper White card stock rectangle. Stamp lines and splatters from Gorgeous Grunge stamp set with Crush Curry ink and Pool Party ink. Add a strip of Washi Tape. 3- Stamp 3 flowers with Strawberry Slush ink on Whisper White card stock. Cut with the matching punch. Adhere on your card with dimensionals and snail adhesive. 4- Stamp your greeting with Strawberry Slush ink. Adhere your card front on the Bermuda Bay card base. For the background, I used the Designer series paper “Epic Day This and That” which coordinates perfectly with the Epic Day This and That Designer Washi Tape! I stamped the car with Versamark and heat embossed it with Pewter embossing powder. I used the Silver Card stock (in the Occasion mini-catalog p.23) to cut the “11”. For today’s card, I used the Sale-a-bration set “See Ya Later”. You can get this set free with a $60 order, only until the end of March! So don’t wait!!! 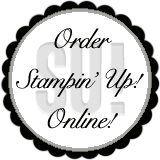 Click here to order today! Tools: Big Shot, Word Bubble Framelits Dies, Chalk Talk Framelits Dies, Banner Punch (SAB), 1-3/4″ Circle punch, sponge dauber. 1. 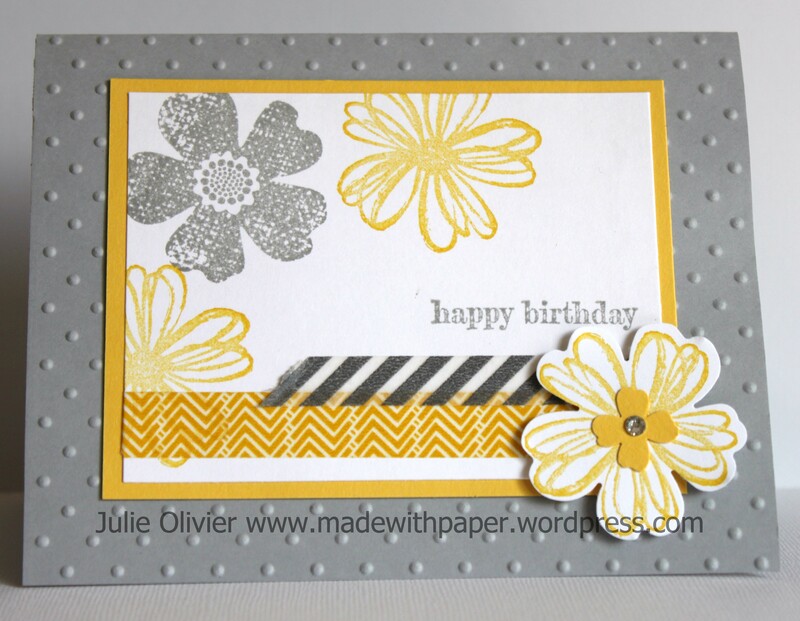 Cut half a Sheet of Daffodil Delight card stock (5-1/2″ x 8-1/2″). Fold in half to form the card base. 2. Cut a 4″ x 5-1/4″ Smoky Slate card stock rectangle. Stamp with the lines and dots from Gorgeous Grunge stamp set with Smoky Slate ink. Use the Epic Day Washi Tape to make a border at the bottom. Wrap a Daffodil Delight Seam Binding ribbon around the edges and secure with Snail adhesive at the back. 3. Use the stamp from “See Ya Later” and color with Daffodil Delight and Smoky Slate Stampin’ Markers directly on the stamp. Stamp on Whisper White card stock. Cut with the Chalk Talk framelits die. Adhere on the card with Dimensionals. 4. Make the sun with a 1-3/4″ Circle punch and cut 7 “banners” with the Banner punch. Adhere on the card with snail adhesive. 5. 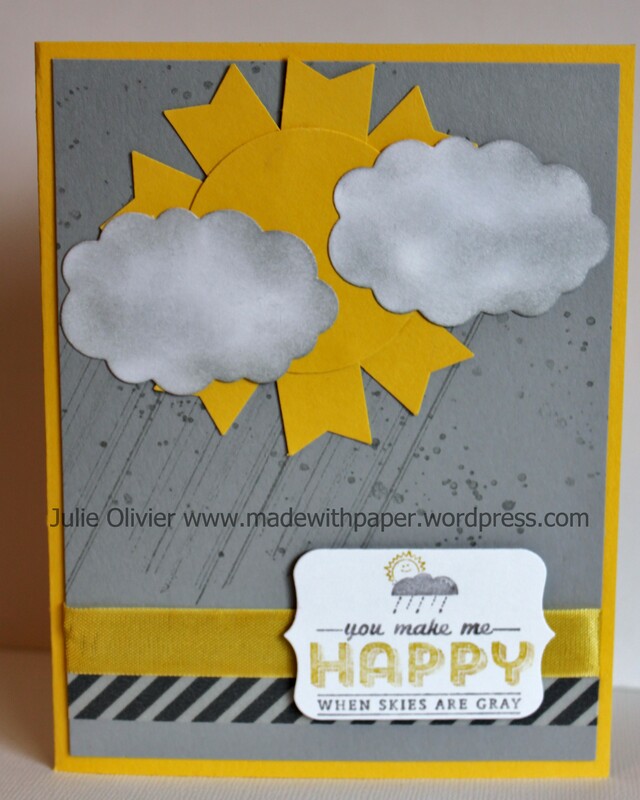 Use the Word Bubble Framelits die to cut 2 clouds in Whisper White card stock. Sponge with Smoky Slate ink and a sponge dauber. Adhere on the card with Snail adhesive. Adhere your card front on the card base. Today’s card was made with “Valentine’s Day” in mind, but I think it’s a card that you could also give at any moment during the year to someone very special in your life. 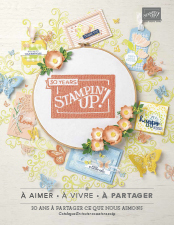 I used the Happy Watercolor stamp set ,which I have to admit, is probably my favorite in the new Occasion mini-catalogue! 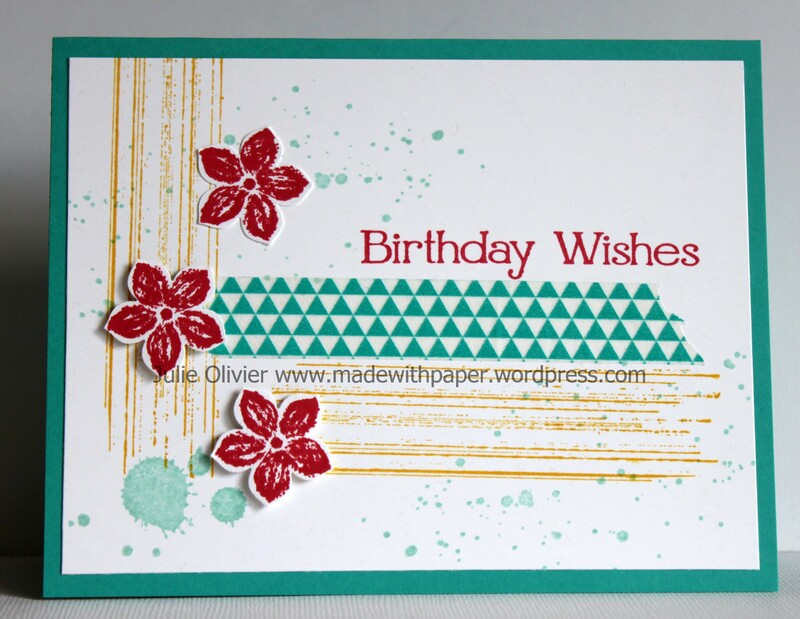 I also used the new Scalloped Tag Topper punch to create the tag on the card. (See this post where I also used it on another card.) After making the tag, I put some Watercolor Wonder Washi tape on it and than I used the Hearts a Flutter Collection Framelits to cut the small heart out. For the background, I first stamped the image that look like Watercolor splatters from Happy Watercolor set in Crumb Cake. Then I stamped the little dots in Gold Metallic ink as well as the saying “You make me happy”. I embossed the card stock with the Decorative Dots embossing folder and sponged it with Crumb Cake around the edges.